Before my trip to Alaska, I looked for one and only one book that I would pack to take along. In no time at all, I realized this was the one I needed. They’ve been publishing this annual guide since 1949, and each year it just gets a little better. 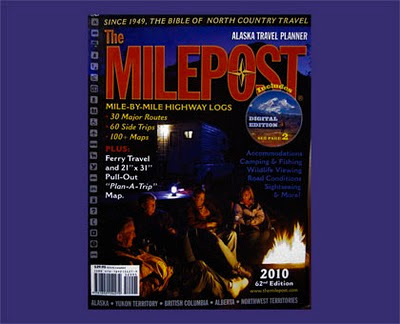 It covers the 30 major routes that traverse Alaska and the Northwest Territories with thousands of milepost numbers listed and helpful information about that immediate area. It also covers 60 more side trips that you might certainly do well to investigate. Reading the guide, you know before you pass it, whether or not it’s something you want to see or visit.